The Harriers longest serving player, Simon Russell, has finally left the club for York City after being ostracised by fans for a series of below par performances last season and now this. 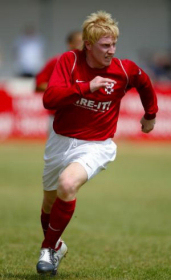 The tricky winger was originally signed by Jan Molby in July 2004 and immediately became a firm fans favourite with his gingery blonde hair and eye for goals. This pre-season though he made it clear, as did Dean Bennett, that he wasn't happy with the terms being offered by our cash strapped and blinkered club and refused to sign a proper contract. By the first game of the season two weeks ago he still hadn't signed and when he was named in the starting eleven for the Lewes game it was rumoured that he was on a pay as you play contract. Now York have stepped in to sign him after Mark Yates hinted that some players would be going out on loan or leaving this week. During his four years at Aggborough Simon has made 158 appearances and scored 17 goals including one memorable one against Oxford (see below). Coming into Aggborough is a player that Yates said we could not fit into our squad because we already had too many defenders. Now he seems to have changed his mind because Keith Lowe has now joined the club on non-contract terms following a period without a club after he finished his trial period here. The former Wolves man has also seen service at Swansea and Port Vale. He should be in the squad for the Altrincham game tomorrow.